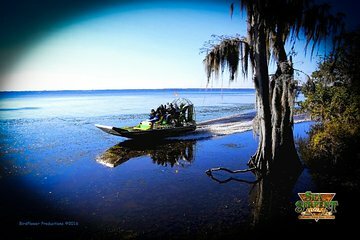 Explore the freshwater tributaries along the scenic St. Johns River on a thrilling airboat ride that skims through a maze of shallow waterways. Watch for alligators, manatees, birds, and snakes as you speed through the watery Florida landscape, and learn the story of an infamous pirate ship that sank in the St. Johns River. This St. Johns River airboat tour includes personal headsets, so you won't miss a word of the captain's fun and informative commentary. We thoroughly enjoyed our safari airboat ride. Our guide was very entertaining, knowledgeable, and knew where to find all the wildlife. I would recommend this fun and beautiful adventure. We really enjoyed our airboat tour, Capt MIke was a great guide and provided a lot of insights and details about the rivers and creeks, trees and wildlife. We saw alligators, turtles, herons and other birds. Definitely recommend taking the tour, you won't be disappointed! This tour was fantastic! Our tour guide was informative and entertaining! We saw 6 gators ranging in size from 2 feet to 6 feet! I would definitely go again! We had a wonderful time with Captain Mike on the Sea Serpent. Not only was the ride smooth and exciting, the interactive story telling and audio narration kept the trip stimulating to the mind as well. We enjoyed an exciting date and can't wait to come back and have more adventures with Sea Serpent Tours. This is a perfect tour for teenage grandchildren. Thank you Captain Mike for putting a smile on their faces! Capt Mike is awesome, he is very informative and entertaining and we talked about how much we enjoyed the trip for days after our ride! The boat fit a family of 6 easily, we had 4 adults and 2 kids and had no issues fitting. We went from smiling and laughing as Capt Mike revved up the engine and jumped some waves to trolling in the back river in a majestic back river preserved in its natural state full of gators, turtles, birds and other wildlife. We had an awesome time and will definitely go again when we return to the area, highly recommended!